Welcome to the five hundred and thirty-fourth of my blog interviews with novelists, poets, short story authors, biographers, agents, publishers and more. 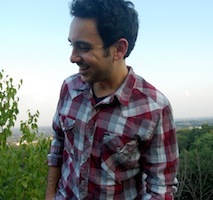 Today’s is with YA author and poet Nick Orsini. A list of interviewees (blogged and scheduled) can be found here. If you like what you read, please do go and investigate further. Morgen: Hello, Nick. Please tell us something about yourself, where you’re based, and how you came to be a writer. Nick: I’m 26 years old, based in New York / New Jersey. I came to be a writer by way of unemployment and bad feelings. Morgen: I should say “oh dear” but definitely a good out of a bad. What genre do you generally write and have you considered other genres? 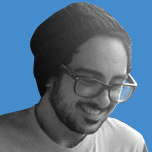 Nick: I generally write young-adult fiction but am trying to dabble in superhero stories. Morgen: Both incredibly popular. What have you had published to-date? Do you write under a pseudonym? Nick: I’ve published two books: Fingerless Gloves and Two Wrongs Make a Vice, as well as Bruce Willis with Hair, a collection of poetry. 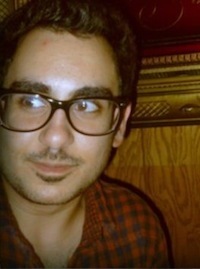 No pseudonym …just Nick Orsini. Morgen: It’s a great (and distinct) name, I’d have kept it. 🙂 Are your books available as eBooks? How involved were you in that process? Do you read eBooks or is it paper all the way? 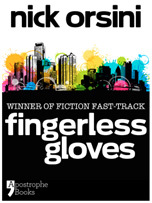 Nick: Fingerless Gloves has just been published as an ebook (http://apostrophebooks.com/fingerlessgloves), while Two Wrongs is available only in hard copy. I read a fair amount of both. I like ebooks on my iPad, but sometimes prefer to carry around a paperback. I’m not too committed to either method. Morgen: Me too, and I’d say 95% of the people I’ve interviewed have said the same. Only a handful prefer the eBook foregoing the paperback but houses have to have them, don’t they. Which authors would you compare your writing to? Nick: It’s a fine mix between a John Hughes movie and a Nick Hornby novel. Nick: I try to write every day: a piece of a new novel or a poem or a letter. I do suffer from writer’s block and, when it hits, I try to not write … to spend some time away from the computer. Morgen: Perhaps it’s your brain telling you it needs a break. Do you plot your stories or do you just get an idea and run with it? Nick: I just run with ideas. I’ve tried to plan out novels and poems but there’s nothing more exciting than just letting a story dictate where it wants to go. Morgen: Absolutely. I’ve had more ‘pantsers’ here than plotters, and I’m the same. I’ve written a few (a dozen) notes for this year’s NaNoWriMo novel but will end up just seeing what happens. I did that in 2009 and wrote 117,540 words. 🙂 Do you have a method for creating your characters, their names and what do you think makes them believable? Nick: I roll up as many qualities of the people I know or am friends with into my characters. They are blends of 15-20 different people in my real life. I think that’s what makes them believable. Their traits and characteristics are very reality-based. They don’t do fantastic things, they just exist in the same imperfect world we all do. In terms of their names, I name them what I would name my kids. If I think “that’d be a great name for a kid” …it becomes a great name for a character. Morgen: I love that. Do you do a lot of editing or do you find that as time goes on your writing is more fully-formed? Nick: I do edit as I go along, and try to edit the entire book at the end. Nick: If I make a pop culture reference, I always double-check it. Morgen: You mentioned your book of poetry earlier, do you write any other poetry, non-fiction or short stories? Nick: I’m a poet over at www.AdorkableLife.com and a commentator for www.ThoughtCatalog.com. Morgen: I’ve added Adorkable Life.com to the links on my Post-weekend Poetry page and had a quick look at Thought Catalog, it looks great. Do you have pieces of work that you think will never see light of day? Nick: Probably some of my deeply personal and depressing pieces from college. They weren’t very well-written and are all very raw. If I had a hard time emotionally, I would write “I’m having a hard time emotionally” … it’s very amateur. Morgen: But now you’re more practiced to know how to ‘fix’ them (should you wish of course). Have you had any rejections? If so, how do you deal with them? Nick: I’ve been rejected by over 75 publishing houses. I keep all the rejection emails in a Gmail folder so that I can look back on them one day and realize just how resistant the publishing industry was to change. I’m really happy with Apostrophe Books (www.apostrophebooks.com) as they allow themselves to go against the industry flow. They have a diverse and eclectic catalogue to show for it! Morgen: They’ve been very supportive of my blog. 🙂 Do you enter competitions? Nick: The Fiction-Fast Track (http://apostrophebooks.com/fictionfasttrack) was the first competition I ever entered. Morgen: Ah yes, Apostrophe’s MD Martyn Forrester mentioned that in our interview. It sounds like a great idea. How much of the marketing do you do for your published works or indeed for yourself as a ‘brand’? Nick: I’m not sure I consider myself a brand. I always keep an eye out for new artists and new designers, so I’m always attempting to look for new imagery that I think could exist hand in hand with my writing. I think that’s the key in branding anything. I have these poems and books, and if I could put pictures to them, what would those look like? That’s how I market. Up until this point, I have done all the designs for ancillary materials myself. Morgen: That’s a good idea. Regardless of who (if anyone) we have behind us, we still have to do the majority of the marketing. I’ve only had one author say that her (Top 6) publisher does all her marketing but she’s still very active on Facebook and Twitter. What advice would you give aspiring writers? Nick: To not be afraid to stop writing … I don’t mean stop all together, but you have to remember to have the experiences worth writing about. The words will come only when you push yourself out of your comfort zone. Always keep your eyes open and never be afraid of new people. Morgen: New people are just friends we haven’t met yet (or thereabouts) and yes, keeping our eyes (and ears) open is a great way to glean inspiration (and overheard conversations). If you had to choose a single day from your past to re-live over and over, what day would it be and why? Nick: The day I graduated from Marist College in Poughkeepsie. I just felt so many raw, intense things that day. I was unsure of myself, my surroundings… I was going home with no job or job prospects or any way of making any kind of money. It was terrifying and probably one of the most honest moments of my life. Morgen: Wow. Is there a word, phrase or quote you like? Nick: I like the word “bizarre”, I think we need to use it more. Nick: I am a contributor to two blogs: www.ThoughtCatalog.com and www.Tellmesomething.org … I commentate on movies, life, wrestling, all of it. Morgen: (Another site I’ve bookmarked) What do you do when you’re not writing? Nick: When I’m not writing, I’m at the movies, hanging out with my roommate or my close friends, thrift-store browsing, playing video games on Nintendo 64, looking for new action figures, listening to pop-punk music or trolling the internet for corgi pictures. Morgen: <laughs> Where can we find out about you and your writing? Morgen: Thank you very much, Nick. What a great interview. I like this author. His youth, interests, and experience are inspiring to me. I always feel as if authors have the best stories. Pingback: New Fingerless Gloves Interviews and Trailer | Nick Orsini Never Says Die.